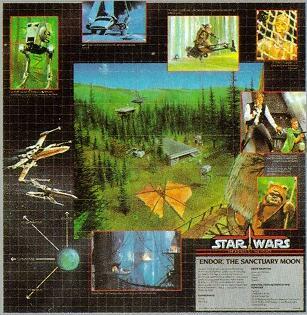 The Endor map shows a painted scene in the center from the Battle of Endor, surrounded by various smaller, relevant paintings. 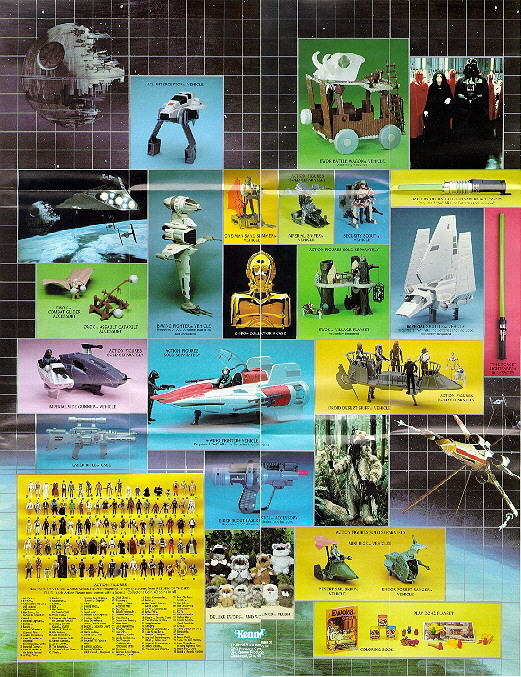 The reverse side of the map shows various toys from the line and can be viewed here (218k). It's interesting to note that some of the toys, such as the POTF Biker Scout Pistol, were never actually released under a Power of the Force logo. An AT-ST Walker (All Terrain Scout Transport) stumbles over a cascade of logs released by the Ewoks. Darth Vader's personal shuttle rests on the Imperial Landing platform. On a stolen Speeder Bike, Luke Skywalker is pursued throught the forest by Imperial Scouts. C-3PO is suspended in an Ewok hunting net high above the ground. Blasters ready, Princess Leia and Han Solo prepare to battle Stormtroopers outside the bunker. Wicket, the Ewok who first befriended Princess Leia on Endor. Rebels, Droids, and Ewoks celebrate their victory over the Imperial forces. The final two border images are of the moon itself and two X-Wings. The moon painting has four arrows pointing to various other planets in the SW Universe. The northerly arrow states "To Hoth", the NW one "To Death Star", the westerly one "To Tatooine", and the SW one "To Bespin". It is interesting to note that the names of the other two Planetary Maps are included. It is not known whether Bespin and Hoth were planned as Maps, but seems likely if the line had continued. Covered by lush green forests with trees up to a thousand feet tall, Endor was the staging ground for the final confrontation between the Empire and the Rebel Alliance. Here, aided by the courageous Ewoks who make Endor their home, the Rebels disarmed the shield generator that protected the nearby Death Star. Now vulnerable to attack, it was destroyed by Rebel fighters.